Utility for optimization of non-vanilla textures and meshes with the minimum possible loss of quality. External texture tools are no longer needed, all operations with DDS are made using DirectX capabilities. Requires DirectX 9. New messages when there is nothing to optimize. Full BSA hashing. Now only updated BSAs will be decompressed/optimized. Option to optimize files in custom folder. Warning! You must have at least directories from under Data\textures or Data\meshes folders or exclusions won't be applied! 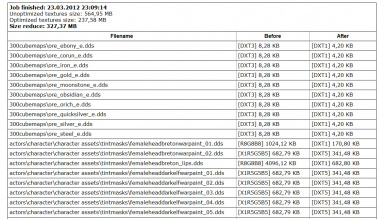 BSA compression is applied only if all files in archive are meshes, textures or both. Last SMCO update was in 2013, so it has no idea about new BC7 compression format used in Skyrim SE. Use at your own risk. - both of them in \Skyrim\Data\*.bsa files. BSAs are also compressed. You can also select custom directory with files to optimize, but they must be in the same folders as used in game (from under \Skyrim\Data\textures or \Skyrim\Data\meshes) or exclusions won't be applied! Program requires minimal to none configuration and was set up for the maximum compression with the minimum quality loss as a priority. Why should I optimize my mods? It is always better to have clean and efficient files. BSA - effects from textures and meshes optimization + even more free disk space. It has native 32 and 64-bit executables, supports multithreading and can take the advantages of multicore processors. E.g. 5GB texture folder is processed in less then 3 minutes (performance was tested with SSD and i7 2600K 4.9Ghz HT Off). SMCO has a hash comparison feature that makes subsequent optimization runs much faster (thanks to Nowhereville for the idea). During first optimization SMCO remembers hashes of processed files and all runs after that will optimize only updated files. This also prevents from recompressing already optimized BSAs if there are no files in them that can be optimized. 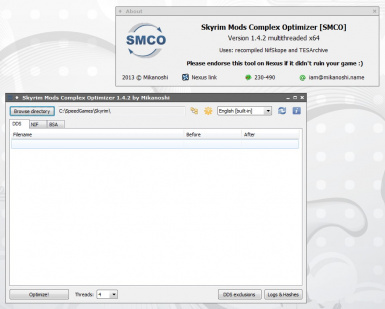 - If Skyrim folder wasn't detected automatically, browse it manually. You need to provide path to the Skyrim's root folder (where TESV.exe and SkyrimLauncher.exe are located). * Move your mouse above interface elements to read their descriptions. Utility itself requires only DirectX 9 or above, but it uses external tools to convert and recompress. and your BSA files in ...\Skyrim\Data\ directory before doing anything! This is a new option and you should be careful with it. In contradiction to texture optimization it can cause game crashes. Luckily such crashes happen only when entering area with optimized meshes and therefore are 100% stable ;) and can be easily tested. If you found such meshes, please post them in a comments section so they can be added to exclusions. Utility unpacks .bsa files, optimizes .dds textures and .nif meshes they contain and packs them back with a higher compression rate if possible. TESArchive tool is used to pack files, it automatically creates backup of a file it overwrites, but only a single one. Backup has .bak extension and is stored in the same directory as .bsa. Sometimes size of BSA archive can increase after optimization, it's because SMCO doesn't compress BSAs that contain certain file types. If there is at least one file of such type, archive will not be compressed. 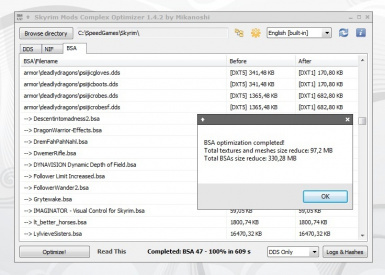 That file may be unused ingame or duplicated as a loose file, so you might not notice any problems with original compressed BSA, but there is always a possibility. SMCO tries to follow the vanilla archives compression rules, so it can fix errors caused by improperly compressed BSAs. - Some NIFs after being optimized can cause crashes in game. Please report such meshes in comments thread. - Not really an issue, but TESArchive also creates .bsl files along with the .bsa, they are not required by the game and can be deleted manually.